Sourdough bread has been around for hundreds of years and to this day continues to be a staple in the family diet all across the world. The ancient technique of harvesting wild yeast from the air we breathe, feeding it with flour and water, and watching it grow into a culture that will never die. Thus, supplying families all over the world with a taste unlike any other. 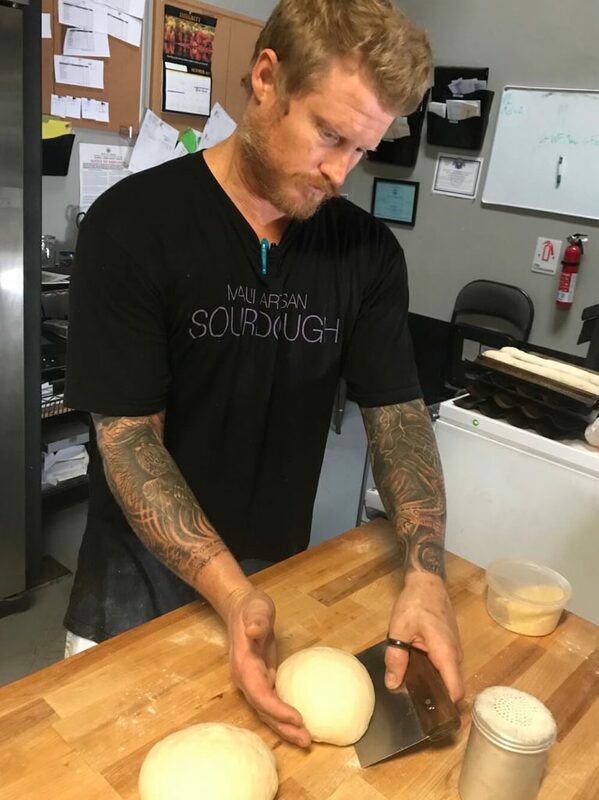 Maui Artisan Sourdough has developed this method to perfection and continues to improve the freshness using all natural products to ensure quality, extend shelf life, and give the community the freshest sourdough bread baked daily. The method of long fermentations gives the bacteria, lactobacilli, a chance to convert starch into sugar and release lactic acid, creating the sour flavor. Each handmade baguette, boule (round), or batard (loaf) baked by Maui Artisan Sourdough is shaped and carefully handcrafted before a long fermentation. I thrive to share my passion for Sourdough with the island community and visitors who frequent this tropical paradise. Locals and visitors want “real” Sourdough and comfort of real bread with healthy benefits. Although there are small craft bakeries here, it’s hard to find REAL bread these days and on the Hawaiian islands where most store bought bread has been shipped or flown in from the mainland or elsewhere. “Who knows how long this bread has been thriving in the heat, or passed from one truck to another before it hits the major retailer.” These big companies are mixing harmful chemicals into there mass-produced bread to easily preserve it for the long journey to the stores for profit. For example, potassium bromate is used to extend shelf life, reduce the chance of mold growth, and to change the appearance of the bread to look appealing. Unless the consumer reads further into this ingredient, they won’t realize that potassium bromate is banned worldwide except in Japan and the U.S. It’s been known to cause cancer along with kidney and thyroid tumors. Other ingredients include high fructose corn syrup, which has been linked to diabetes or excessive weight gain. Or acids like vinegar to mimic a Sourdough flavor, but without the true grown wild yeast. Quick enhancement for quick sales and profits! The good news though is I wouldn’t have known any of this information if it wasn’t for the love of learning the creation of Sourdough or understanding how yeast activity works as a community to leaven the bread during the dough fermentation and baking process. I was given my first starter back in San Diego by another chef working at the Four Seasons. I saw his Sourdough, tasted it, and wanted to learn how to do this. I couldn’t believe that loaves of bread can spring upward to create a beautiful dome made from tiny microscopic yeast that were captured form the air we breath. I was told to feed and care for it as if it were my very own pet. I bought Sourdough bread books and learned about fermentation. The art of bread making seemed like so much fun. It seemed so easy to just follow a recipe and add a starter to it, watch it double in size, put it in a pan, and bake it! How easy can this be, right? Wrong! My experience with my first pan loaf of Sourdough bread was a disaster. A heavy, dense brick of bread that wouldn’t even come out of the pan I baked it in. Of course at the time I didn’t know what bannetons, couches or lames were. It smelled like good Sourdough bread, but definitely did not resemble a beautiful dome-like loaf of bread that I’ve seen many times before in magazines, cookbooks and bakeries. I kept at it though, asking the chef what I was doing wrong and trying different recipes. Flour, water salt, yeast! I tried so many different recipes from so many professional Sourdough books, Google, and YouTube. I read about the sponge method, the pre-ferment the night before to build strength of the starter before adding the remaining ingredients the following day. Tried it, and still ended up with a dense brick of Sourdough. It looked like gluten-free bread and was not the end result I was looking for. I knew I was just learning a new skill, but I just didn’t understand the Sourdough bread game. If I was following the recipes step by step, then why wasn’t it working? During the period of 1 year, I watched guided YouTube videos from the experts, Googled recipe after recipe, and would frequent the book stores to read and purchase another Sourdough book.